The Sacred Strokes is a collection of various stroke sequences and sessions, many with ancient shamanic roots. The focus and intent is on spiritual and emotional healing, rather than a physical treatment. 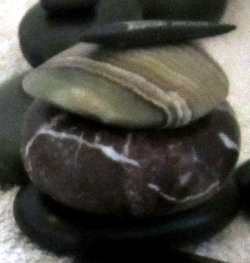 Each Sacred Stroke is a sequence of stone placement and motion, which often is a full body treatment. Several different techniques are used and intuition plays a big role in what precisely is done during each session. There is an atmosphere of ceremony when Sacred Strokes are offered. The work is done physically, emotionally and spiritually, and the effects can be very profound. The contraindications of Sacred Strokes are often few. The physical manipulation during a session is generally very gentle and safe. Stimulation of pressure points, a gentle face massage, placements of stones on the body, using sound and tapping of stones and ritualized movements of the stones over the body. The temperatures of the stones are warm and cool as opposed to hot and cold during a more physically intended session. Sacred Strokes can be used in their own right as a full treatment, or parts can be implemented into other body- and stone work sessions. Once the practitioner has learned the different techniques and understand how the various parts work, it is easy to trust intuition and utilize exactly that which will benefit the client most this moment. Many of the Sacred Strokes have never been given name before. The use of stone placements and motions in bodywork is ancient shamanic practice and has been used for countless generations among the Medicine People of the Native Americans and of course also elsewhere in the world. The teachings of Sacred Strokes comes through Jenny Ray and the Bear Clan of the Santee Dakota Sioux. The teachings were delivered orally and visually to apprentices, relying on memory alone to carry on the traditions. Now for the first time, these profound practices are systematized and shared in writing and a way which lives up to the requirements of various Massage Therapy Boards and accreditation organisations. To learn all the Sacred Strokes that Jenny Ray has organized and written down, you need to attend sixteen full days of intensive classes. And what you learn is only a fraction of what the Medicine People know and use when they treat their clients and patients.